Over 400 schoolchildren from Suffolk and Norfolk are being treated to a national science festival next week thanks to EDF Energy. 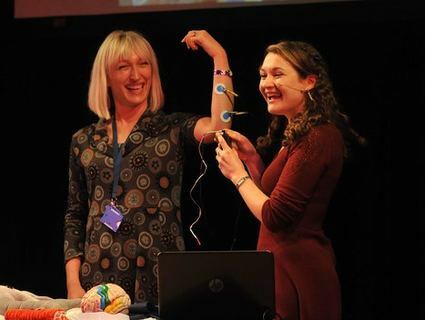 The Cheltenham Science Festival arrives at the Saint Felix School in Southwold on Thursday 30 November and promises to inspire and engage inquisitive young minds with experiments and hands-on fun, courtesy of science enthusiasts Jon Milton and Ginny Smith. Jon will be giving an interactive session on the wonderful world of robots, getting the students on stage to take part in fun experiments and looking at how robots work. Jon is a science communicator who previously worked as part of a science comedy act Punk Science for the Science Museum and has written books and appeared on numerous TV shows promoting interest in STEM. Meanwhile, Ginny will be running a brain hackathon! Students will explore how nerve cells send messages through the brain and body as they create a giant ‘neuron’ live on stage! The free ‘LabLive’ shows have amazed over 11,500 Key Stage 3 pupils from around the UK with entertaining, inspiring and mind-expanding science since it started in 2011.